Lucky Streak Live Baccarat is played with 8 decks dealt from a manual shoe. 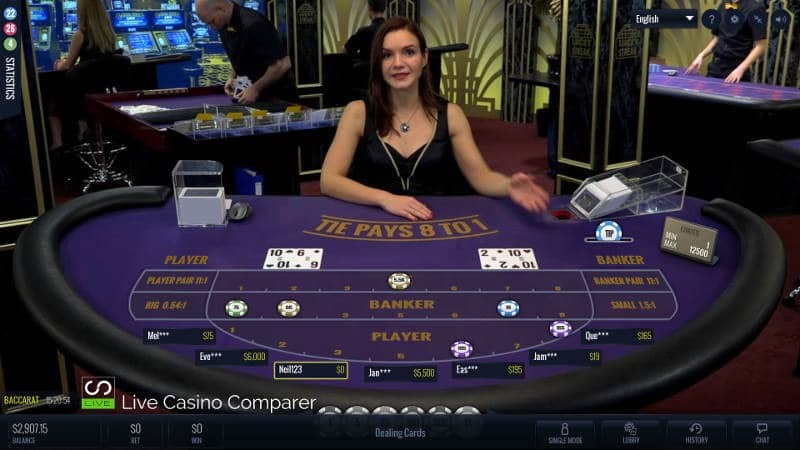 There’ a complete range of sides bets and two viewing modes – Single & Multi Player which give an added dimension to this very popular table game. 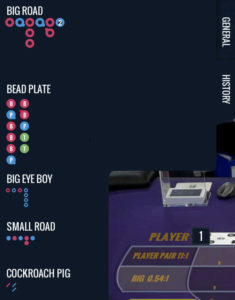 The multi player mode displays up to 7 players chips across the table, which gives you an insight into how others are feeling the shoe is playing. For past action on the shoes there’s a good selection of Roadmaps to choose from. Single Player mode is just that, it’s you and your chips. Lucky Streak Live Baccarat scores well with it’s 2 playing views. I really like the option to switch between the multi & single player views. 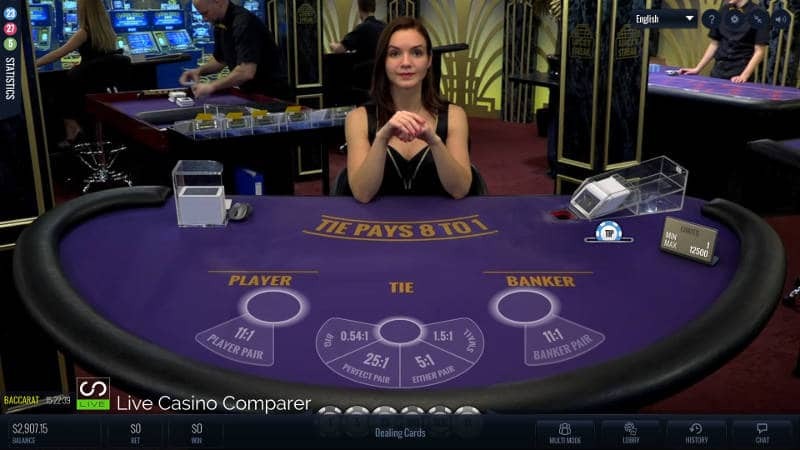 Baccarat is traditionally a game of trends and superstitions, so it’s a shame the betting stats aren’t shown in real time for each game round. This is where you have to rely on the multi player mode to give you a sense on where bets are being placed. The Roadmaps are OK, there is a good selection, but I’d like to have seen more detail displayed regarding the value of each hand. I find this sort of information useful if I’m playing the side bets – it gives me more detail on what’s happened so I can make my bets based on some sort strategy. As you can see the Roadmaps are displayed down the left side of the screen which are built automatically as each hand completes. I find the Big Road and Bead Plate most useful. 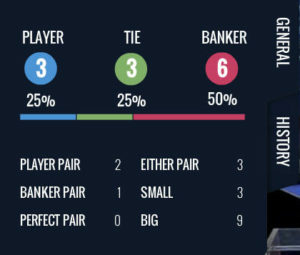 I’ve detailed it in my Baccarat Playing Strategy. The Baccarat History shows the number of times the side bets or main hands have won. It’s a running count of the overall number. Again useful if you want a quick feel about the shoe. The table layout for the single player view is really nice. I like that payout odds are displayed on all the betting positions for the side bets. The table view is clean and uncluttered. The multi-player view presents 7 seating positions. You don’t have a choice of where you’re sat when you flick to this mode. The great thing with this mode is you get to see how 6 other players are betting. It’s feels a more communal game as a result. The Video stream is not HD quality, which normally isn’t a problem. But I do experience a few glitches with the screen freezing occasionally. I’d like to say it’s my connection, but it happens most times when I visit the tables at Lucky Streak. Streaming quality is controlled by the playing interface and if you have it set to Auto it will downgrade the picture quality if the connection is struggling. This can be manually adjusted in the settings. There’s a couple of nice things to point out when you enter the table for the first time. Helpful hints pop up displaying useful features and also there’s a nice win box animation when you win a hand. If you don’t like them they can be switched off in the settings. I was pleasantly surprised with the Live Baccarat. I’m not a massive player, but I enjoyed playing while testing. It’s not as slick as some of the other suppliers, but that is part of its charm. It’s got everything you really need. As you’ll find out the dealers are fun and up for a chat. They can really make the session for you. Sometimes the sound quality is a challenge, but don’t be afraid to ask them to speak up. Unless you give feedback they won’t know there is a problem. While there’s some great casinos offering Lucky Streak Live Baccarat my personal preference is Leo Vegas. It’s a great casino but also has other suppliers so you can do some comparisons yourself to see what I mean. Baccarat 5 – 15k None To see the latest Live Casino promotions. Click Here. Baccarat 1 – 12.5k None To see the latest Live Casino promotions. Click Here. Baccarat 1 – 500 None To see the latest Live Casino promotions. Click Here.